Looking for a place to eat with that 5-star appeal and a unique quirk without breaking the bank? This is precisely what I and my girlfriends were looking for when we decided to have a girl’s date night for Valentine’s Day. We looked no further than FIVE: a bar/ restaurant nestled in downtown Tuscaloosa and attached to its own coffee shop, FIVE Java. Now before you picture a quaint cafe filled with lace and iced cakes in a display window, let me better explain. The java side of FIVE is cafe-esque. With two long wooden tables in the middle, surrounded by faded canary upholstered seats that sink when you sit in them and a mini window library for coffee and literature lovers alike, it has style and class with a shabbiness that gives it an instant cool vibe. Take this vibe, style, shabbiness, and class and nod it up a few levels, and that is what you get when you go to the bar/ restaurant side. With exposed brick walls littered with urban artwork of artists (writers, musicians, etc), mirrored windows, and an array of mismatching chandeliers, FIVE bar and restaurant holds an allure with an edge tapered in hipster chic. Dimly lit, it offers an ambiance with candle-lit tables (fake candles, of course) each decorated with a fresh flower. Yet you cannot help but to feel irresistibly chic when you run into their corner lounge. Settled beside the full bar, it too is lit with candles, but also presents a bluish glow from a hidden light source. With white couches, a coffee table situated in the middle, all atop a fluffy white rug you get the feeling of belonging and an essence of being someone. FIVE has an effortlessly cool factor that many cannot resist—my friends and I definitely could not. All set to attend FIVE, on Valentine’s Day I arrived with two of my friends. All single, we had decided to treat ourselves to a girl’s day: some shopping, dinner at FIVE, and a movie. FIVE was the most awaited moment of the night. Not only because we were hungry, but because we could not wait to take in the venue while eating fresh, flavorful dishes complemented by the water set for us in our own large glass bottle to self-serve. FIVE does not take reservations, but surprisingly with it being a holiday, we did not wait long. Our waitress was friendly and sweet, but not overbearing, which was nice. 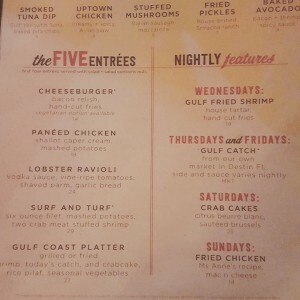 FIVE’s menu features a certain five entree dishes each day, nightly specials, and an array of appetizers (called snacks) and desserts that are immovable from the menu. FIVE also has different lunch menus and brunch on Sundays. 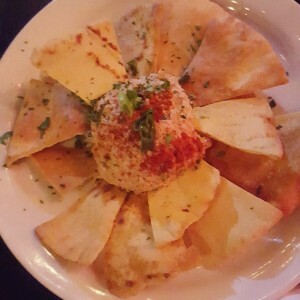 After glancing at the menu my friend KB immediately announced that she was getting smoked tuna dip to start and was not sharing–that changed. The smoked tuna dip arri ved in ice-cream-scoop-form on a leaf of lettuce surrounded by pita chips and topped with a flaming red spice–that could very well have been paprika–and green onions. The Yellow-fin Tuna in the dip was not as sharp of a fish flavor as I presumed. The dip had a creamy texture complimented by the abrupt crunch of the pita chip. Combined, the dip and chips exhibited a smoky saltiness calmed by the mellow flavor of the cream. We finished the dip in mere minutes, even the lettuce. Once it was time to take our order we all ordered the exact same dish: lobster ravioli. The ravioli took a while to cook, but upon its arrival we were drooling at the smell and presentation. Covered in a vodka sauce, the ravioli was dispersed into an oval-like pattern, topped with parmesan cheese and parsley and served with a spring salad– which mixed spring mix, apples, grapes, walnuts, goat cheese, and a light fruit vinaigrette–and a piece of toasted garlic bread. I dove into the salad first and was met with a sweet, crunchy, nutty flavor that attracted the many textures: crisp lettuce, dense goat cheese, juicy apples and grapes, and crushing walnuts. 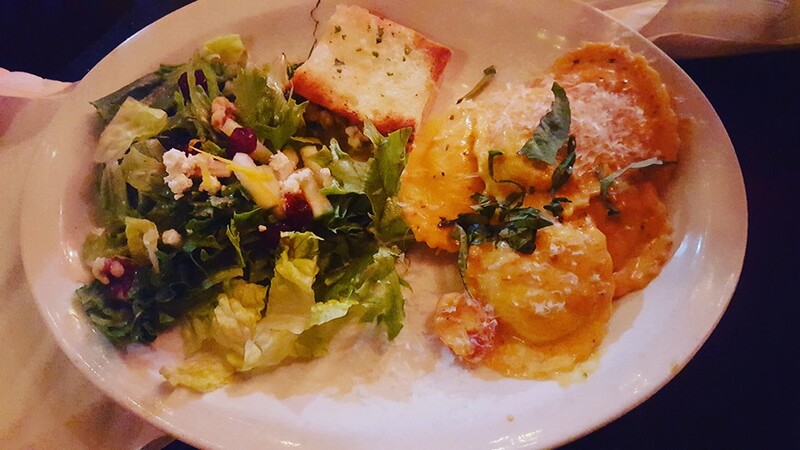 A light, but filling side, the house spring salad paired perfectly with the heaviness of the ravioli dish. Despite its weight, the ravioli was lightened by the fresh lobster bits nestled in the blankets of pasta, cuddled up to the fresh tomatoes and cheese. With each bite the plump ravioli burst with flavor: popping, succulent lobster bits and tomatoes swimming in a buttery, creamy, and slightly sweet vodka sauce. Although we were all full from our ample amount of food, we still decided to get dessert because it was “treat-yourself”-day. We decided on the same dish again as well: a red-velvet raspberry cheesecake. The cheesecake arrived, sadly, in a to-go box due to us wanting to make our movie. Despite the bland exterior, peeking inside the cardboard box made my mouth water. A piece of cheesecake, baked in a graham cracker crust and winded with a ribbon of red velvet, laid in the box on top of a flurry of raspberry puree and a piece of the fruit teetering on the top. I was disappointed with the small size of the cheesecake, but this quickly changed once I took my first bite. Decadent, thick, and endlessly sweet the cheesecake cured my craving and topped it off with a tangy raspberry drizzle. I was about to burst, but I was simply satisfied—and in dire need of a nap. My girl’s date night to FIVE was everything I could have asked for. The venue made me feel edgy and like I belonged. FIVE has a homey touch that welcomes even the most extreme of persons, and paired with their sensational food, well, any guest is in for a great resteraunt experience. Especially since they help those who, like me, are indecisive, with their simple menu layout. 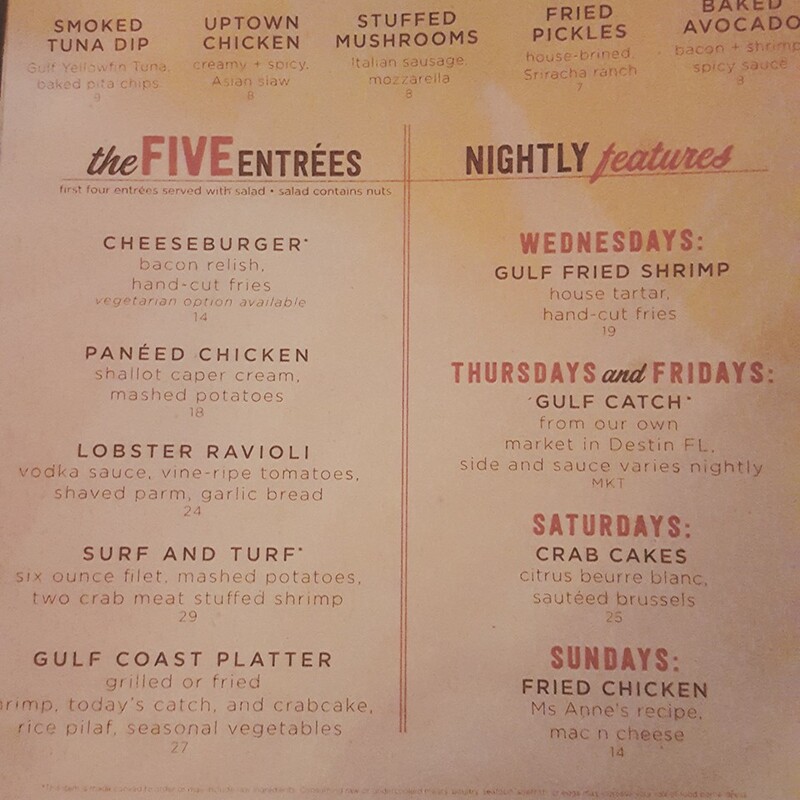 If someone is looking for a shabby chic dining space with a full bar and menu, nestled in the heart of downtown Tuscaloosa, then FIVE is the way to go, no question. So ready your tastebuds and wear your stretchy pants because FIVE is a treat that leaves anyone satisfied.